Less than 140 pages long, this guide to the Earth offers a rapid-fire tour through our planet’s place in space and time through the last 4,560 million years. 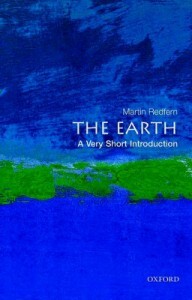 Martin Redfen presents an up to date story piecing together the different disciplines of geology, astronomy, physics and atmospheric and environmental sciences to better understand the history of the Earth. The story is well researched, and written in a style that tries to blend scientific discussion with colloquial thoughts and carefully chosen analogies. Individual subjects, ranging from explaining how geologists measure the age of rocks, to the formation of the Moon, through to the survival of life 1 km under the sea floor and methods of earthquake prediction, are presented in bite-sized overviews. Condensing so much information into such a short guide is always going to be a challenge, and it sometimes feels that the subjects are a little jumping all over the place instead of forming a cohesive story. However, on the whole I was impressed that so many topics could be shoe-horned together to provide a useful overview of the processes that have shaped our planet. All in all, if you have limited time and only want to dip into a subject, this sort of condensed introduction to a complicated topic like the Earth will hopefully whet your appetite for a more in-depth knowledge.